Supergirl, Lena and Alex must form an unlikely alliance to go after the woman they see as the weak link of Lex Luthor's plan - Eve Teschmacher. Unfortunately, Eve is far smarter tan anyone gave her credit for - something the three women realize as they track Lex's "Ms. Teschmacher" across the country. Meanwhile, James is urged to confront the trauma his sister is sure he's repressing as Ben Lockwood works to help President Baker with his plan to repeal the Alien Amnesty Act. The DEO is supposed to be providing extra security for the President. So why are all the personnel in the Oval Office armed with standard issue pistols? Granting that it's a trope, why are the White House security so stupid as to waste ammo and risk a ricochet trying to shoot Supergirl in a crowded, dark room full of panicking civilians? It is unclear at this point just where President Baker stands on the whole issue of alien rights. It seems to vary from episode to episode if he is as big a bigot as Ben Lockwood or if he's just a political opportunist who will do anything for votes. The fact that he is pushing forward with repealing the Alien Amnesty Act, despite having seemingly pacified Lockwood's followers by giving him a Cabinet post and not being worried about the many people protesting in favor of alien rights suggest he truly is a bigot. Carl Lumbly is always a welcome presence as M'yrnn J'onnz, yet there is something about his performance and stance here that seems to emulate David Aja as Manchester Black. If it is revealed that his appearance here is art of Manchester's further manipulation of J'onn, then it may be the single must subtle performance ever seen on this show. David Harewood also does a fantastic job depicting J'onn's breakdown in the face of his father's apparent disappointment. The attack on the White House scene is blocked like a horror movie and is truly scary. James PTSD attack during the battle is also well executed visually. The title of this episode comes from a 1950 film. It is the only film in Oscar history to secure four award nominations for actresses - two for Best Actress (Bette Davis and Anne Baxter) and Best Supporting Actress (Celeste Holm and Thelma Ritter). It is ranked #14 on the AFI 1998 list of Greatest American Films. M'yrnn makes mention of the Martian city of Z'onn Z'orr. In the classic DC Comics Universe, Z'onn Z'orr was the name of a Martian colony city established on Earth thousands of years earlier in what became Antarctica. Hidden under the glacial ice for millennia, it was unearthed by the White Martians who attempted to invade Earth disguised as an alien superhero team called The Hyperclan in Grant Morrison's JLA: New World Order. It was briefly used as a Fortress of Solitude by J'onn after the Hyperclans defeat, but was later burned down during a battle with the villain Malefic. Eve Teschmacher's research logs show that tried to extract the Harun-El serum from someone after treatment. Lex Luthor and Eve Teschmacher used Cadmus' Metallo Protocol to revive Otis Graves. This is revealed to be how they brought him back to life. There were five failed test-subjects before him, one of which was turned into a semi-robotic guard for Eve Teshmacher's lab. One car in Washington DC employs an x-ray scatter shield that blinds Supergirl when she tries to look through it. This car houses a hologram of Eve Teschmacher that tells Supergirl to enjoy the show once its light field is disrupted. This also triggers a Lexo-suit which confines Supergirl was the Red Daughter is impersonating her while attacking the White House. Supergirl: I, uh...I come offering donuts and my help! Supergirl: Uh, so why are we in the burbs? J'onn: You can't just leave. After everything we went through for you to pass the Symbols on to me?! M'yrnn: You can imagine how disappointed I was when you resorted to violence. J'onn: That's why I was trying to contact you! I need your help! I'm trying to... I'm trying to figure out who I'm supposed to be. M'yrnn: The easiest question in the world. J'onn: (stammering) What's the answer? J'onn: I ask you for help and all you do is turn up and you make it worse. (gripping M'yrnn's shoulders) I'm the last Green Martian! If I lose myself, we not only lose Martian religion... I... we lose everything! Our entire history! Every memory you ever gave me! (strangled) My wife... my daughters. M'yrnn: (deadpan) So this is urgent? M'yrnn: I know what will solve this problem. J'onn: (desperately) What? What? What? M'yrnn: A nice hot cup of c'off'ee! M'yrnn: I will stay for one. Lena: Were you sick at all, Bitsie? Bitsie: Me? Healthy as a horse. Why? Lena: Oh, just something Eve said about a cousin with cancer and two daughters. Bitsie: My blood orange cake! Want some? Supergirl: I can never turn down cake! (whispered) She's lying. Her heart is as fast as a hummingbird's. Lena: (quietly) Yeah. I think so too. Supergirl: Uh- Bitsie? Your... your hands? Alex: Your hands should be scalded. They're not even red. Lena: You were sick. You were on hospice. Eve cured you with the serum I made for James. She was here. Bitsie: I - I want you out of my aunt's house! Bitsie: (innocently) I drink a lot of milk? Eve Teschmacher (exaggerated, as if speaking to a child): Okay! When YOU, get the signal, go THAT WAY, exactly 900 meters. Red Daughter: (annoyed) I speak English better than you. J'onn: Everything I did, I did in the name of peace. J'onn: He was a killer! M'yrnn: Then so are you. J'onn: Well, what would you have me do? Sit around and pray all day while the world around me burns, like you did on Mars?! M'yrnn: (evenly) At least I didn't run. The episode opens with Alex leading a DEO team into Lena Luthor's office. They find a drugged Lena and a letter from Lex Luthor, addressed to Lena, left behind by Miss Teschmacher. The letter to Lena berates her for betraying Lex and testifying against him and expresses his disappointment that she was so easy to fool, first by working Miss Tessmacher into her trust and then by manipulating her into perfecting the Harun-El cure. He warns her not to come after him because he may not be so sentimental as to let her live next the next time they meet. Lena tries to tell Alex something but Alex tells her to just focus on resting. J'onn searched the entire South Pacific but could find on sign of Lex or his helicopter. Kara makes reference to Superman being off-planet. J'onn tries to cast a psychic net to locate Lex. Instead, he hears the voice of his father and passes out. J'onn says he has newfound clarity as to who he is not, but fears he no longer knows who he is. There is an ancient Martian story about a race of shape-shifters whose planet was destroyed. That had to constantly change shape to survive but ultimately forgot what they truly looked like and who they had been. J'onn decides to try and use the staff of his father to contact his spirit for advice. James is released from the hospital. He got a clean bill of health but still seems to be jumpy about loud noises. Kelly Olsen is a psychologist specializing in trauma treatment. President Baker is moving ahead with the repeal of the Alien Amnesty Act now that everyone in the world is distracted by Lex Luthor's escape from prison. Supergirl goes to the DEO to offer he help and brings donuts with her. Kara says that Lex Luthor usually retaliates within 48 hours of a prison escape. Col. Haley is fond of cinnamon crullers. Col. Haley has ordered most of the DEO personnel to Washington D.C., by order of President Baker, to act as extra security during the ceremony repealing the Alien Amnesty Act, specifically to counter unrest and protests by alien rights groups. According to Col. Haley, the FBI, CIA, the US Marshalls and possibly US Navy SEAL Teams 1-6 are currently assigned to the manhunt for Lex Luthor. In fact, every law-enforcement agency except the DEO seems to be involved. Supergirl informs them that Lex Luthor now has superpowers. Col. Haley agrees to monitor the operation in DC, freeing Alex and Brainiac-5 up to assist Supergirl. Alex suggests that she should talk to Lena Luthor about Eve Teschmacher given her rocky history with Supergirl. Kara gives Alex a Superman signal watch so she can summon her directly if she needs help. Supergirl tells Brainiac-5 that Nia is at the Fortress of Solitude, trying to dream up a lead on Luthor. Supergirl returns Brainiac-5's Legion flight ring. M'yrnn shows up at J'onn's office in the flesh, as he is meditating trying to commune with M'yrnn's spirit. M'yrnn says that J'onn's office reminds him of the library at the University of Z'onn Z'orr. M'yrnn says that he returned in the flesh because J'onn failed and he is taking the Sacred Symbols back. J'onn passes out again as M'yrnn takes the symbols, now manifested as a vessel on J'onn's table, away. Lena leaves the hospital and visits Lillian Luthor in prison. Lillian says Lena was prone to migraines as a child. Lillian is aware of who Eve Teschmacher is and mocks her for following Lex like a love-sick puppy. Lillian says that Lena's friends will abandon her once they find out what she did to try and save Lex and that she'll be all alone again. Alex brings Lena in to help in the manhunt for Lex. Lena isn't happy about working with Supergirl, but says that finding Lex is more important than her grudge. 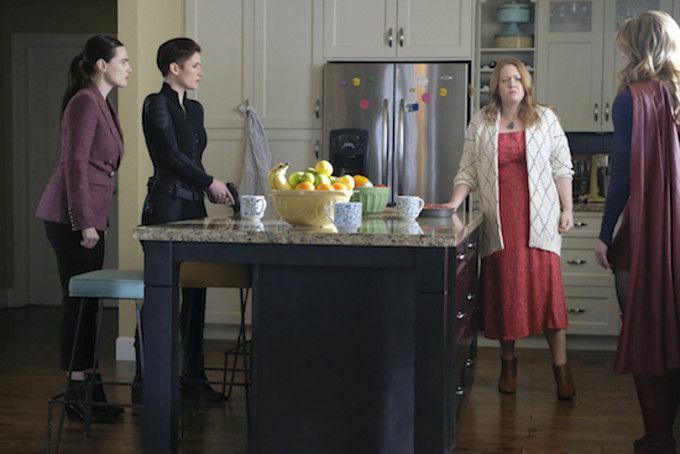 Lena goes with Alex and Supergirl to meet Eve's elderly aunt, Mary Tessmacher, who lives in National City and is the only family Eve has in the city. Eve apparently visited her every Sunday. Ben Lockwood has a meeting with a Senator Grandbury, who informs him that she changed her mind and is voting against the repeal. Her justification is that denying aliens with superpowers basic rights might lead to an all-out war with humanity. Lockwood suggests the Senator should fear the common man more than aliens. She doesn't buy it. M'yrnn stays because J'onn passed out. He eventually agreed to stay and listen to J'onn's problems for one cup of coffee. Mary Teschmacher is revealed to be on vacation in Florida. Her house and plants are being taken care of by Bitsie Teschmacher, who claims to be Eve' s favorite cousin and bowling partner at family reunions. Bitsie has twin daughters who are currently at camp. Bitsie Teschmacher says she hasn't seen Eve in months. Lena remembers from 407 that Eve said the she had a cousin with cancer with two daughters who was in hospice care. Bitsie shrugs this off and says she's as healthy as a horse. Supergirl determines Bitsie Teschmacher is lying because her heart is racing like a hummingbird's. It is revealed that Bitsie was given the Harun-El cure after she accidentally takes a cake pan out of the oven without protecting her hands and breaks a kitchen counter by pounding it, insisting that she's perfectly normal. Bitsie affirms that Eve cured her cancer but insists that she is a good person who could never be involved with Lex Luthor. She says that Eve came to her and cured her recently, while on the run from the police, risking getting caught to save her life. Eve had a secret lab at National City University. Eve and the Red Daughter are seen dressed as technicians working in an access tunnel. Kelly Olsen says she could fit ten of her apartments into James' office at CatCo. Kelly gives her brother referrals to other trauma psychiatrists in Central City. Lex Luthor tried to kill James Olsen on eight occasions. James says the only time Kelly ever visited him was when he was in the hospital and she could tell him what to do. Eve's lab at National City University is lead-lined. Supergirl discovers Harun-El inside a safe in Eve's lab. Lena confesses that it was hers and that she synthesized more after giving all of the original samples to Alura Zor-El. Supergirl is angry about what Lena did but Alex points out that Lena's work has saved lives, including James'. Kara admits she was wrong and says that she is just stressed out by the thought of failing to protect the world in Superman's absence. She apologizes to Lena for judging her. The three agree to let bygones be bygones. Lena finds blueprints of Lillian Luthor's prison in Eve's lab. Eve's computer password is ILoveLex. Even and Lex revived Otis using the Cadmus Metallo protocol. They had five failed test-subjects before bringing him back, one of whom was likely transformed into the robot guarding Eve's lab. Alex and Lena are able to destroy the new Metallo with an improvised grenade. Brainiac-5 is given the Kryptonite hart of Metallo. Supergirl finds a Cadmus-13 pistol in Eve's lab. This is the same type of pistol that shot James. Brainiac-5 later confirms that it is the gun that was used to shoot James. This suggests that Eve Teschmacher was the shooter, which makes sense as she could have gotten into CatCo relatively unnoticed without raising suspicion. Lena, Alex and Supergirl puzzle out that Lex was behind the plot to shoot James and, quite likely, behind the creation of the Children of Liberty. Lena says that she will talk to her mother in prison and try and get more information from her on Lex's plans or what Otis has been doing. Supergirl says that she will go to Washington DC to ask Ben Lockwood about his connections to Lex Luthor. J'onn says that he is the Martian Manhunter and that it was a mistake for him to try and take up his father's role as a priest. J'onn says that he can take the sacred symbols of the Green Martian religion to the Desert of T'ozz - the place where H'ronmeer first imparted them to the Martians, They can lie dormant there until someone worthy comes to claim them. M'yrnn reveals that he is just an extension of J'onn's memories of his father and that they have not really been talking. J'onn says he realizes that, but says it was still good to see his father again. Kara tells James that Eve was the one who shot him. The Alien Amnesty Act was appealed, thanks to Senator Grandbury changing her mind. At the press conference where Senator Grandbury announces her vote, Eve Teschmacher is briefly visible in the crowd of people behind the Senator after her image inducer briefly fails. Lena shows Lillian the blueprints that Supergirl found. She points out that Lex wrote out the notation for Lillian's cell in red ink - his subtle notation for marking people needed to die in his plans. This means that he was coming for Lillian, not to break her out of prison, but to kill her because she knew something that could be used to track him. Ben Lockwood is revealed to be ignorant of why Senator Grandbury changed her vote. When he asks why she changed her mind, she glances at the disguised Eve Teschmacher, and tells Lockwood to just take the win. James attends the signing ceremony at the White House, among the many photographers allowed in to shoot the ceremony. Supergirl is held captive by a Lexo-Suit after falling into a trap planed by Eve Tesmacher. Red Daughter attacks the White House, dressed as Supergirl. James has a PTSD attack in the middle of Red Daughter attacking the White House. President Baker declares Martial Law in response to the attack and declares Supergirl public enemy number one. Alex says there is no way Supergirl was responsible for the attack. Col. Haley agrees. James tells Kelly that he does need help dealing with his trauma. J'onn leaves the planet to return to Mars, to take the sacred symbols back. As he is doing this, he misses Kara's call to check up on him. Lena and Alex call Supergirl with the signal watch, to let her know that they believe she is innocent and will help her prove it. Despite the title, this episode has almost nothing to do with Eve Teschmacher and everything to do with tending to all the subplots that have been neglected over the past two weeks while Lex Luthor was being established. It does this effectively, though there is a bit of irony in the finale, that Kara should find herself going into a search for the truth alongside her two best friends, whom she has lied to intensively in the name of a greater good. This is a far more compelling conflict than everything involving the Children of Liberty and the increasingly erratic President Baker. Thankfully, there's nothing in this episode that is glaringly bad either, apart from the James subplot, which is somehow made even worse by the inclusion of James' annoying sister Kelly.